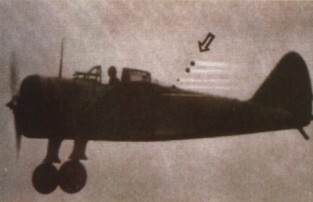 Both Axis and Allied pilots in World War II reported ball or disk lights that would occasionally appear and follow the plane or squadron and then mysteriously disapear. 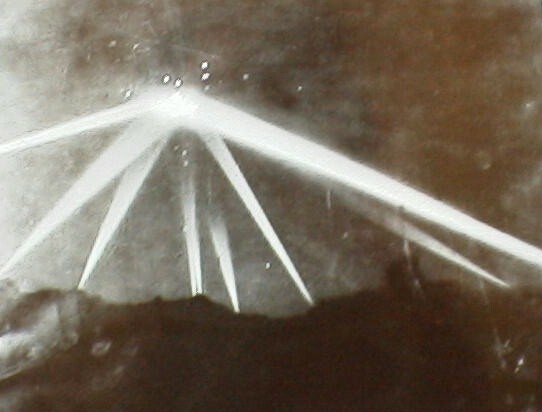 The Allies named these strange lights, Foo Fighters. 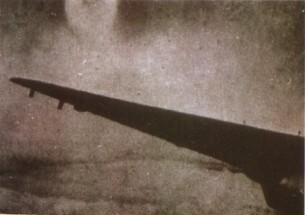 This photo is of a World War II Japanese fighter, perhaps an early version of the Zero, with non retractable landing gear. The photo has been in public view since the 1960's. 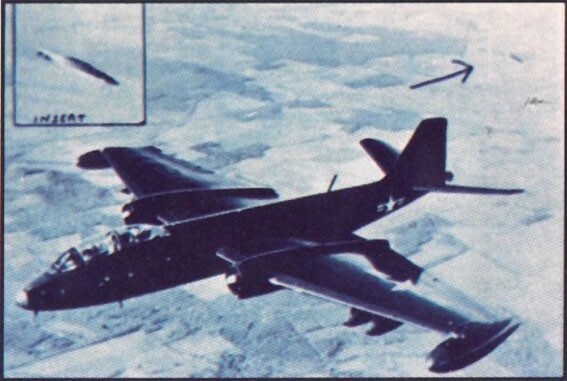 The dots behind the plane are supposed UFOs. 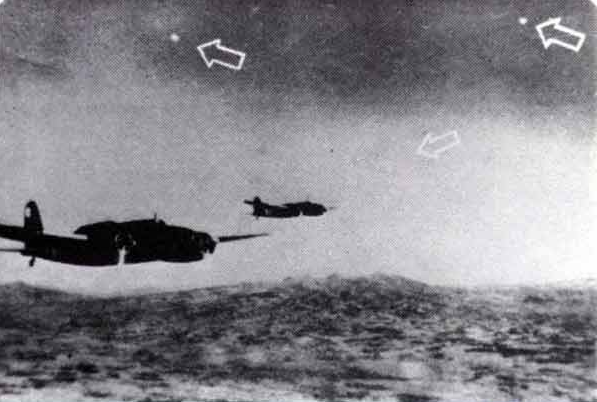 These three planes are supposed Japanese torpedo bombers, over the Pacific's Devil's Sea, in 1943. In the far corner of the snapshot are UFOs. 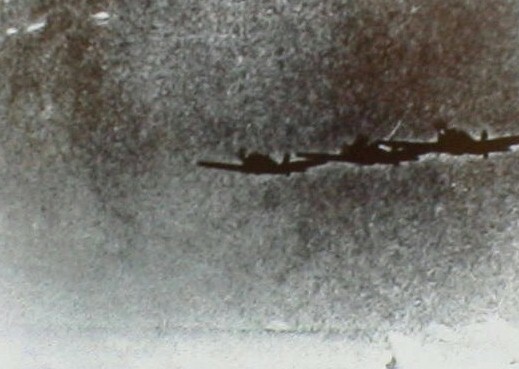 A Japanese Sally bomber (some say it's a Betty), with a UFO (Foo Fighter) trailing it. This photo has been in public view since at least the 1960's. There is some question what make these aircraft are. 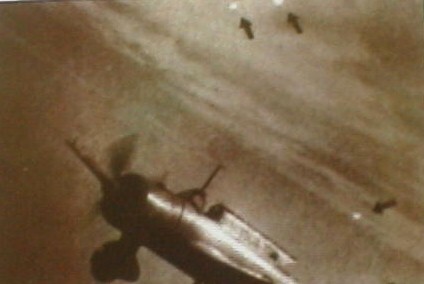 or Tachikawa-Kawasaki KI-36 fighters from 1942. The UFOs are plainly seen - circular and triangular. 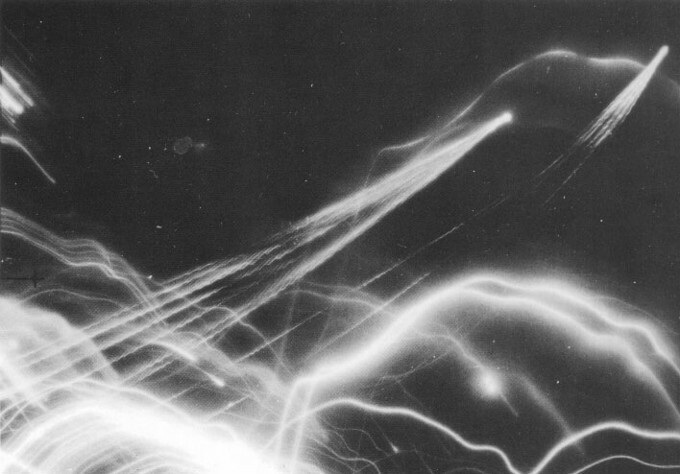 This February 1942 photo, is supposedly of a UFO that was tracked and fired upon over World War II, Los Angeles. There were many explanations for the barrage that was thrown up over Los Angeles, military and civil authorities at first thought that a Japanese plane or planes were over the city, a night raid. Then others said it was an off course American pilot who was in a no fly zone. Another story was a barrage balloon had broken from its cable. Swamp gas, itchy trigger fingers, imagination, also were at one time or another the culprits for setting off the fireworks. The comedy movie "1941" mentions this incident. Some people say it's a picture from a propaganda film, a WWII gunnery film or montage, in training how to shoot down an enemy plane. The bottom line is that the night skies of Los Angeles were lit up by A/A fire in 1942, what they were shooting at is still debated. 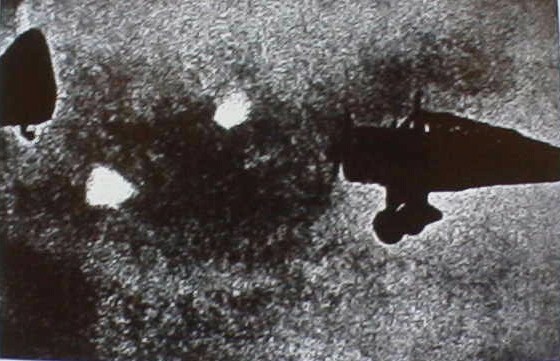 This World War II photo of a Japanese torpedo/bomber has been around since the 1960's. Some say it's legit others say it's a doctored combat strike photo. The UFO's (lights) can be clearly seen. 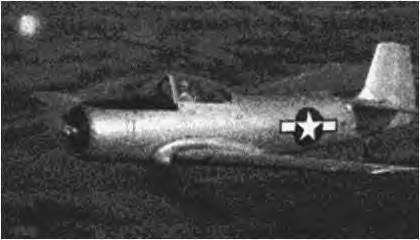 Is this fighter, a single engined allied plane or an enemy Me109 - by it's cowling it looks like an Axis fighter. 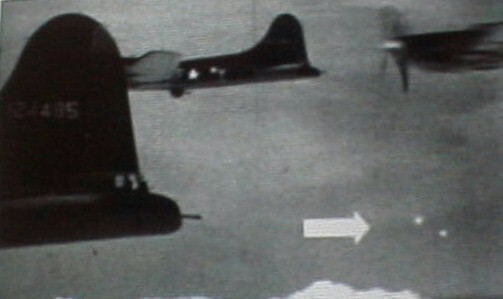 This photo looks like a fake - notice how close the fighter is to the B17 and how out of proportion the fighter is. 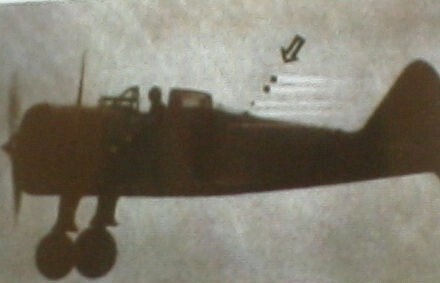 Then again this photo could be legit, but where is the tracer fire? 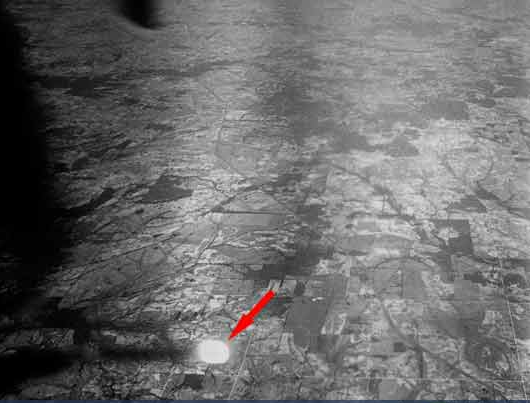 Maybe it's a doctored photo from film stock from the 1962 movie "The War Lover"
Actually Wasserfall missiles launched at night according to a photograph of the Public Records Office. 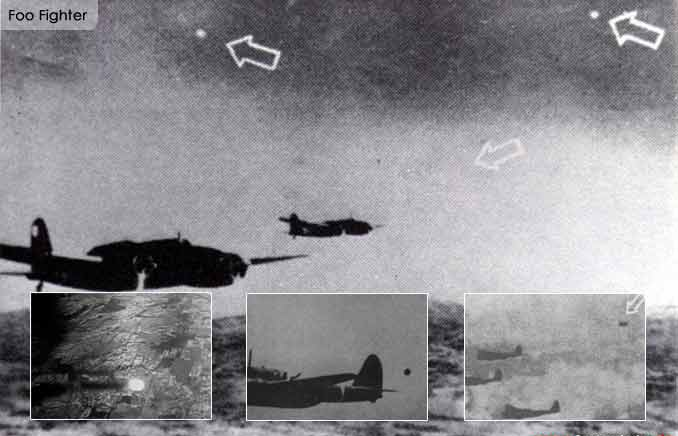 Image from "Allied Photo Reconnaissance of World War II" by Chris Staerck and other authors. Parkgate Books, PRC Publisling Ltd. 1998.